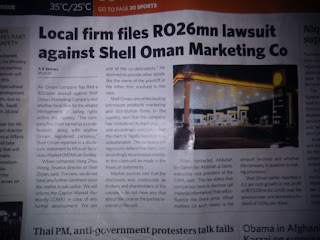 On Monday, Muscat Daily ran a cover story detailing that Shell Oman Marketing Co. SAOG, along with another Omani registered company has had a legal case filed against it for RO 26 million by an Omani company for the alleged infringement of selling rights within the country. Companies must disclose the value of any claims against it, and what they're provisioning for it. 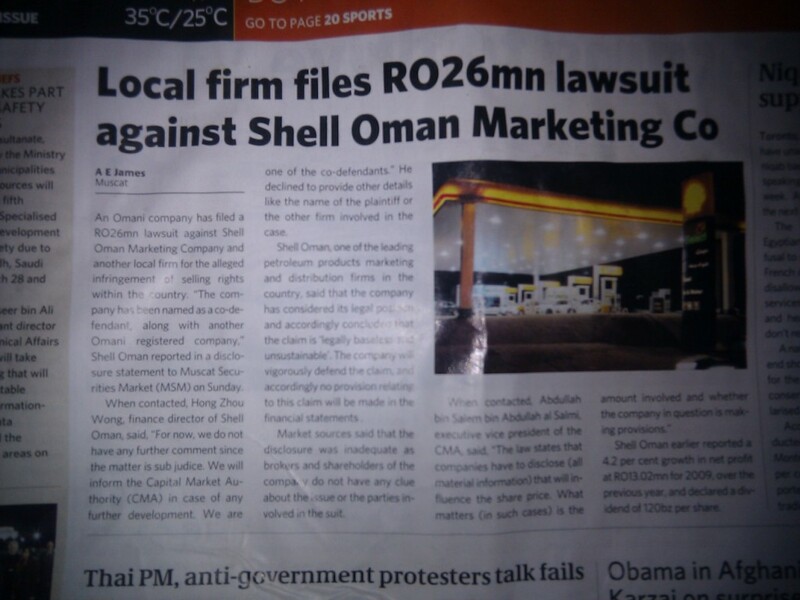 In this case, Shell Oman Marketing Co. SAOG have conformed to the letter of the law by saying: "Some other company is trying to sue us for RO 26mn, and we're provisioning bugger all for this claim, because it's totally unsustainable - we even had our lawyers look at it". Which does amuse me - Ok I took a bit of artistic license in how the boys at Shell said it, but, reading between the lines, thats what they said! haha! So lets take a look at this magic number of RO 26mn. By looking at Shell Oman Marketing Co. SAOG website, you can easily find their published financial accounts. The total profits for 2008 and 2009 total RO 23.5mn (2007's profits were RO 11.1mn on turnover of RO 248mn). So this claim for RO 26mn is a big chunk of change, and apparently represents a situation that has been on-going for at least 2 years (well, since 2008 - assuming the co-defendant is being sued for a bit too). However, when reading the report for 2009, you see that Shells' largest turnover centre is retail, taking 48% of their annual turnover. You have to think about potential companies (Omani companies) that would be able to even consider filing a claim for RO 26mn (and have a hope at getting it entertained) against Shell. They'd have to be involved with more than one element of Shell's core businesses (which are Aviation fuel, Commercial Fuel, Retail and Lubricants) - or this is an issue that's been building for more than just 2 years. Except that the statement from Shell said that it was for the "infringement of selling rights" within Oman - The Lubricants division exports a lot of it's finished oil products out of the country (and represents 19% of the company turnover), so perhaps the case revolves around fuels and retail. Hmmm! Suggestions on a postcard please! Oman Oil (BP)? Al Maha (Chevron)? The share price has held firm at RO 1.950 with very few trades done. One does wonder whether the "market sources" were just trying to manipulate the share price to turn a quick buck? I wonder because a total of 4, yes, 4, trades were made on SOMS on March 28th (no trades yesterday). So when you look at it like that, you could say that Shell only hold 20% in this company, or you could say that Dutch companies hold nearly a 50% stake in this company, with Omani interested holding holding a mere 15.3% stake. Certainly an eye-opener for what is touted to be an "Omani" company. Interesting! Time will tell who the company that is attempting to claim RO 26mn is. Thanks for sharing... after checking their website, it would be possible that it's them filing the case. So it's a case of a Franchisee getting shirty with a Franchisor. Doesn't look good for Al Sarooj.